Seventeen-year-old Charlaina knows she has exceptional but perilous powers. In the far future, in a land controlled by an aged and ruthless queen, the classes are strictly divided by the language they speak. Even acknowledging a member of the ruling class while they are speaking their native tongue is punishable by death. Charlie can understand all languages, a secret she must protect to stay alive. When she meets the alluringly handsome Max, who speaks in a language she hasn't heard before, she is intensely attracted to him. Max believes that Charlie is the key to something bigger and he pledges to protect her. But as war descends, can she trust him? I'm a massive fan of Kimberly Derting's body finder series so I couldn't wait to pick up the first book in her new dystopian fantasy series The Pledge. I wasn't disappointed and I think if anything I'm going to like this series even more than the body finder books. My main disappointment was the fact that I'm going to have to wait a whole year to find out what happens next!! Kimberly Darting has created a unique dystopian world where people of different classes all speak their own language. There is a universal language spoken by everyone but people of the lower serving classes are not allowed to even look at people from the higher classes when they are talking in their own language. In fact just glancing in their direction could be enough to earn you the death penalty! This is a matriarchal world but rather than being a kind and benevolent queen Sabara is more of a tyrannical dictator. Not everyone is happy with their current ruler and the resistance is gaining more backing but can they really make a difference? At seventeen Charlie has a very big secret to keep, she can understand all of the different languages spoken in the realm - something that should be impossible as she should only be able to speak Parshon the language of the vendor class she was born into and Englaise which is the universal language. Her parents have always told her how important it is to keep her ability a secret - after all if anyone finds out about her it could lead to her death - but it isn't easy to listen to people insult you in a language you shouldn't understand and pretend you haven't heard them. I really liked Charlie as a main character, she is smart and brave but most of all I loved the way she looks out for her younger sister Angelina - the two of them have such a close bond and Charlie is like a second mother to her. Angelina is such an adorable character that you just want to pull her out of the book so you can adopt her! When Charlie first meets Max she is drawn to him because he speaks a language that she has never even heard before. She is immediately curious about who he could be and where he has come from. Although attracted to him I like the fact that she doesn't trust him straight away, she is wary of his intentions and he has to earn her trust and respect as she gets to know him. I enjoyed the romance that develops between them and am looking forward to seeing more of them as the series continues. I really liked that we got to see parts of the story from Max's point of view too, in fact I would have liked more chapters from his perspective! We have been introduced to a great selection of characters that I am looking forward to learning more about (particularly Xander, Angelina & Brooklyn). The story is fast paced and kept me hooked from beginning to end and this is a very promising start to the series. 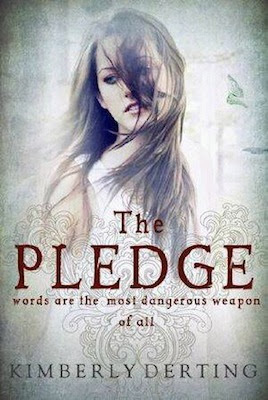 I would definitely recommend the story for anyone who enjoys either fantasy or dystopian books, The Pledge straddles the line between the two and contains unique world building, fun characters, hints of magic, romance and more than a little action. I hadn't seen this cover before, but I love it! I loved The Pledge, and your review is making me even more impatient for the next one. Glad you enjoyed it as well! I haven't read any of Derting's work, but I'm quite intrigued now. Glad to hear that she's so consistently good. Thanks for the review! I totally agree about the pacing-I was on the edge of my seat throughout, dying to know what was going to happen next! @ Bookworm1858 - It was such a quick read wasn't it! I just couldn't put it down because nearly every chapter ended on a mini cliffhanger lol. I can't wait for the next one! Ooh. I'm so looking forward to reading this, I LOVE her other series and I'm sure to love this one too!